This year we have decided to buy a Zoo Pass and go to the Zoo as often as we like. What I really like about this is that we can go just to see reptiles or African animals - and not need to see every animal and exhaust ourselves completely. Last week when we went we were excited to see two baby chimps (12month old). It was lovely to watch their antics - climbing the ropes, being carried and cared for by their mother. 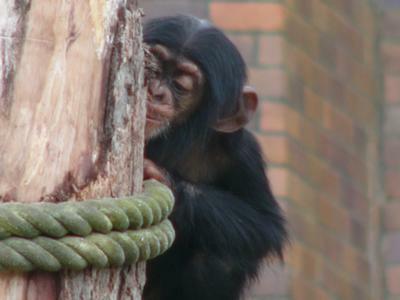 Here's one cheeky little monkey hiding behind a pole.